This region is part of the UNESCO World Heritage sites. There are many Forts (Diaolou – 碉樓) built for protection and for residence back in the 19th and 20th century. Most of the owners were Chinese businessmen who crossed the pacific to trade and work in the Midwest in the US. Even though they lived in the US, they didn’t forget their origin. After making a fortune, they returned to their homeland and built these forts. Each fort belonged to a family where the Grandparents, uncles, aunts, cousins would all live under one roof. These forts are anywhere from 3 – 8 floors tall, which are already some of the tallest buildings in the Kaiping area. Most of these forts are now owned by the government and kept the way it’s been for over 100 years to preserve the heritage and unique culture. I’ll dive deeper into what these Diaolou are all about, but first, let me explain how you get there. Trust me, it’s in the middle of nowhere. Diaolou entrance fee: RMB $180 (5 sites, 2 day pass) opened 9am – 5pm daily. Booking the Bus tickets were really easy. The company that runs these buses is called GDHK (The Motor Transport Company of Guangdong and Hong Kong, http://www.gdhkmtc.cn/search.html ) the website is only in Chinese, so it might be hard for some to navigate. Instead you can book directly from CTS – China Travel Services agency. You’d depart from Prince Edward Bus Stop (Directly across Prince Edward exit A) and end up in Kaiping Main Bus Station 開平汽車站 or 開平長沙汽車站 (not Kaiping Shui Kou Station, that’s somewhere different). There are 5 busses departing from Hong Kong, Prince Edward daily 7:40am, 8:40am, 1:50pm, 4:30pm, and 7:00pm. We picked the 7:40am bus on Saturday to get there just after lunch time so we can have a half day trip. 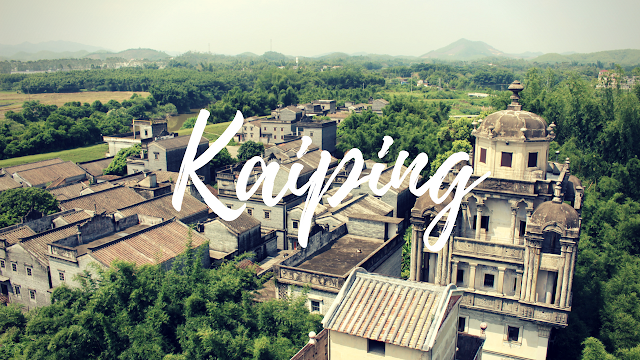 Departing from Kaiping Main Bus Station, there’s also 5 busses daily 7:50am, 9:00am, 1:30pm, 2:50pm, and 4:30pm. We picked the 4:30pm bus on Sunday and got back to HK around 9:30pm. Pan Tower International Hotel is probably the only hotel in Kaiping area that’s anything like a hotel you’d see in tier 1 cities. It’s a 5 star hotel at a very reasonable price, but also has 2 restaurants, a pool, a spa, karaoke room, a pool room, and a table tennis room. You can reserve it on CTrip online and just pay once you get to the hotel. If you call Pan Tower International Hotel, they can help you arrange that. While our driver spoke only Chinese, I’ve heard of other traveler book a driver no problem without knowing how to speak Chinese. They’ll give you a price and the driver’s name, phone number, car type, and license plate number. You can arrange for the driver to pick you up at the bus station. However the driver won’t be there waiting for you as there is no parking available. Once you get off the bus you’ll need to call the driver, so it will be helpful if you can get a working SIM for China or have international calling enabled. The driver we got quoted was RMB 500 for a full 8 hour day, or RMB 300 for a 4 hour half-day trip. While there are busses that get you to the Diaolou area, they only run once an hour. We saw a lot of stranded foreigners trying to walk 15km+ in the blazing heat at 35C. They end up paying for passing by drivers who offer a ride anyway, but often much more expensive then what we paid for booking a driver for ourselves. Another pro for getting a driver is that they can get you the 2 day discounted tickets for RMB180 with their Kaiping residence card. I’m not sure what the full price is, the RMB180 is a super good deal for 2 days and 5 sites! Now that we’ve ironed out the basics, here’s how my trip went down. I haven’t woken up this early in a while, it was just 6:00am in the morning. I could barely open my eyes. The bus station was really easy to find! As soon as you walked out of Prince Edward exit A, it was across the street. Exit A doesn’t show on Google Maps, but it’s near exit D. You’ll see a bunch of grannies with their shopping carts waiting in front of the Bus Ticketing office. They’ll call out the buses as they arriving and what time & destination they’re bound for. There were busses arriving every 3-5 minutes so you need to listen carefully where it’s going. There’s also a sign on the front of the bus saying what route it’s taking so you’ll want to look for 香港 -> 開平. On the top of the front window of the bus, there’s also a 2 digit number, remember that number because that’ll help you find the bus easier when border crossing. The Bus arrived 5 minutes before out departure time. It was the earliest bus so there were roughly only 10-15 passengers on the bus. We drove first to Shatin then west to Tuen Mun, then up to the west side over the connecting bridge to Shenzhen. This is around an hour, and at the Shenzhen border, they kick you off the bus. Passengers have to cross the border on foot, and it’s exactly like the HKG Airport with automatic e-gates. But man, the crowd was huge! It’s only 8am in the morning! On the Chinese side there’s also e-gates, so those with registered passes (mostly HK residents, and in my case, Taiwanese visitor’s pass) can skip the long passport lines. Still, the whole border crossing took just 20 minutes or so. Back at the other side we found the original bus. I vaguely remembered it’s #28. Passengers get really irritated when there are people who take a long time, so try not to wander around because they will leave without you. The journey continues on. It makes a pit stop around hour 3 or 4 on the side of the road. This is only a 5 minute stop at a gas station for people to use the toilet. The traffic going in was really bad so we ended up being 1hour late and didn’t arrive until 1:30pm. Our driver was nowhere to be found outside the tiny bus station. We gave him a call and went across the street to KFC/MCD to grab some lunch quickly. Pan Tower International Hotel had an unnecessarily huge lobby. We checked in and got a room on the 20F with a great view of the city. The hotel isn’t newly built, but it was still really good for the price we were paying. There’s free wifi. Tip: in China most social media sites are blocked, download a free VPN app on your phone to use google maps, google search, facebook, Instagram, youtube etc. Li Yuan was more crowded and really popular. There are many buildings you can see and there’s also a garden, a little river running through, a bird house, and some small food stalls. This one also is popular and has several buildings you can visit. There’s several lotus Gardens and they have some ducks wandering around freely in the area. This one is very natury and has less people visiting and there’s not much to see inside the houses themselves. But it’s built in a massive bamboo garden and is amazing to stroll through. There’s only one building here and it was bombed by the Japanese so there’s holes in the tower, pretty cool to see. It was blazing hot, something like 30-35 degrees. I forgot a hat, but luckily they were selling it everywhere! I got a cute white one in the Li Garden entrance. Our driver also got us a discount 2 day ticket for all 5 sites for just 180 RMB each! What a steal. The entrance can be up to 100 RMB for one location! All of the places seem more or less the same, but Li Yuan and Zi Li Village are the more popular spots and have more to see. Still doesn’t mean that the other ones aren’t worth visiting. They are all unique in their own ways! I especially loved Ma Jiang Long old Village since they had massive bamboo gardens and the buildings look a bit Aztec style with all the carving on the walls and the windows. After the first day at Li Yuan and Zi Li Village, it was already 5pm so most place are closed. Our driver dropped us off at a market on the way back. It was on a river bank, but unfortunately I don’t remember the name of it. It had old buildings but was bustling with street food stalls. Even though it was busy, I still couldn’t feel a tourism push type of feeling. The locals were getting their groceries, there were fruits everywhere, people holding live chickens upside down (poor chicken, I know, it must be wondering why its world is all weird looking now). We got dropped off back at our hotel, rested a bit and then went out for some wandering around. Kaiping at night time was slightly breezy, though still warm. We managed to find a supermarket to stock up on some snacks and drinks for the long bus ride back. And then we found a nearby restaurant. Everything was soon closed by 9pm and between the time we sat down until the restaurant was empty was probably not more than 45 minutes. The food was all served in big portions because most Chinese restaurants are designed for big groups of 5 – 10 people around a round table. We just got some noodles, rice, and a soup and we were stuffed. Day 2 started early at 8am as we had a 4pm bus to catch. We finished off the remaining 3 places – Ma Jiang Long old village, Jin Jiang Li Diaolou group and Nan Lou. A warning, in the bamboo gardens, you might get eaten alive by mosquitoes. So either bring repellent or keep moving. Don’t stop for too long taking selfies or you’ll be mosquito food! I really loved the walk though! It was really quiet and calm in the morning. One down side is though there weren’t many buildings you could go into. Even if you did there’s not much artifacts inside the buildings (very different from the 2 main sites from yesterday) So for the most part we were taking photos from the outside. We finished around 12pm, so it just took us 4 hours to visit all of the remaining places. It was good to have time before check out to take a quick shower and refresh ourselves for the return journey on the 5 hour bus. The return bus at 4pm was packed full of people, not a single seat empty. Traffic was also bad initially, but we caught up after crossing the bridge to go to Shenzhen and we arrived back in Hong Kong around 9pm. It did not feel like it was just a weekend because there was so much to see! It felt more like I just took a 4-5 day holiday. I was also really surprised to see all of the Diaolou buildings that had a mix of Chinese and Western architecture. It’s definitely unique in its own way. No wonder it is listed as a UNESCO world heritage site. Leave a comment below if you have more questions around booking the bus ride, personal driver, or hotel. And enjoy your stay in Kaiping!